Brandon DeGree has been a massage therapist with Avanti Sports Medicine Team since 2009. He received his massage training at the renowned from National Holistic Institute, the de facto standard for many of the employers, such as luxury resorts, spas and medical offices. He performs sports, deep tissue, Swedish and therapeutic massage. Brandon is currently pursuing a career in sports medicine and is attending college at Las Positas College in Livermore. Sports have always been his first love. He excelled as a competitive athlete in high school playing on the varsity football team, basketball teams, and track and field. Brandon incorporates his knowledge of being an athlete with his practical book knowledge to address the needs of his massage clientele. 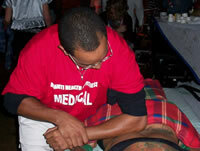 He has a true passion for giving back to his patients through his healing of massage. He is available for sporting events, corporate, private and special bookings.